What does progress mean? If we take the literal meaning it should be about moving forwards - a step forward. But it could just as well be that progress divides, taking some things forward, whilst others are left behind. Or, that progress is just a step sideways. In the Norwegian context the word is also the name of a libertarian political party. It is not a given that progress makes people happier, creates more work, or less road toll, to mention just a few. Progress may be thought of as an abstract notion or a concrete thought depending on how individuals interpret the idea. In the exhibition PROGRESS the choice was made of having the starting point in the small Norwegian town of Skien. The Art Centre lies in this town, hence conforming to this requirement. The artists here do also. The exhibition’s aim is to allow the public to move from the concrete and into the abstract. The title of the exhibition was chosen by the fact that the word seems easy to define, but nevertheless has many different associations for people in society. Sven Drobnitza often works from the starting point of random objects he encounters, which he then begins to collect. Bits of plastic he finds in the street, pieces of soap of which there is little left - the objects are presented almost unaltered in the exhibition space. But, just the same, they contain a dualism: they represent both reality and non-reality at the same time. Using a stylistic presentation, a large number of muselets are almost transformed into images. By placing a plastic beaker and a plastic drinking straw in a corner in front of an electric fan, a hovering air sculpture is created which is at the same time a perpetual motion machine and an impossible concept. Drobnitza’s contribution to the exhibition can be described as directly encircling progress, and thematically covers questions concerning development. Several of the works are included because the artist has spent some weeks in Skien and reflections about people’s relation to objects are essential. The objects would not have had the form they have if they had not been in contact with people. Drobnitza shows both older and new works in progress with themes such as repetition, stagnation and construction. 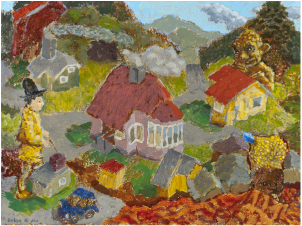 Helge Hansen’s painterly world is at first glance an invitation to a parallel reality. By means of altering proportions and inventing characters, the pictures can appear to have a childlike appeal without any connection to the outside world. On closer inspection they are representations of more realistic situations, and their relation to actual society is clear. In the exhibition it is Helge Hansen’s people, and the relationship between people, which draw attention. By placing some of the pictures in freizes where their similar sizes mean they relate to each other, they can be read as a series, despite being painted in different years. The question is: has mankind developed in a postive direction, and can our relations with each other be said to have made any progress. 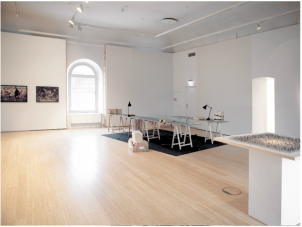 Anna Ihle bases her works in the exhibition on Skien’s history, with a specific focus on the paper industry, and the workers who were employed there. Skien is known for its paper industry, which as well as simply a workplace must have been an integral part of the community for a long time. Developments resulted in the permanent closure of the industry in 2006. With this as a backdrop, the artist shows a fictional place. The starting point is a photograph from an actual work place in the paper industry from the 50’s. By showing photographs and untreated woodblocks in combination with tressel tables, lamps and ledgers, the work place setting raises questions about topics such as working hours and work morale. This project is part of a larger piece of research about work and the worker, in which the artist also draws on her own work situation as an artist. This presentation can be said to constitute the first part of the artist’s Skien’s Council artist’s residency of 2015.